Visit the western Rutherford bench land and discover the distinctive, truly enticing, and unconventional character of the "hidden gem" that is, Tres Sabores. The Vineyards, Ranch, and Winery of Tres Sabores are nestled against the western Hills off South Whitehall Lane, where the winemaker and owner, Julie Johnson, and her family live and grow organically-certified Cabernet Sauvignon, Zinfandel, Petite Sirah and Petit Verdot, Olives, Pomegranates, and Meyer lemons. The Tres Sabores portfolio comprises two sumptuous estate bottlings: 'Rutherford Perspective' Cabernet Sauvignon and Tres Sabores Zinfandel as well as a delightful Zinfandel-based blend: ¿Por qué No?. Tres Sabores is also fortunate to source grapes and make a zesty Sauvignon blanc from Farina Vineyard in the Sonoma Mountain appellation of Sonoma County, a lush and radiantly fruit-filled Petite Sirah from Guarino Vineyard in Calistoga and a dry, spicy (dedicated) Rosé from the estate Zinfandel and Calistoga Petite Sirah. Julie also makes wines exclusively for SABOR Wine Club members, who in addition have access to Library selections during the winter fall & holiday season. All of the Tres Sabores wines celebrate the creativity of winemaking, encourage you to explore your own ideas about taste as well as expand your personal enjoyment of wine "beyond terroir". Visitors to winery are personally welcomed by the owner & winemaker and or one of her hospitality team members for a strolling tour of the winery and cave as well as the vineyards, culinary, and infusion gardens on the ranch. Tastings feature at least five wines from the portfolio as well as olive oil or pomegranate tastings (in season). Guests may make additional arrangements for a vineyard-side picnic gathering under the canopy of a century-old olive grove, special food pairings, vineyard & winery immersion experiences, or barrel tastings.. All guests are also welcomed by to the resident Goldens, 'Moose' & 'Bouzy Rouge'." 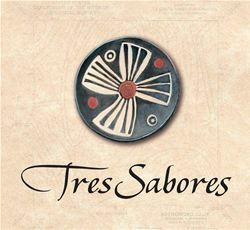 Tres Sabores: the "Three Savory Flavors, or Tastes" in every glass--those of the vine, the terroir and the spirit that good company brings to every table. Romp in the Tres Sabores vineyard with our resident sheep, Guinea Hens, Golden Retrievers ("Moose & Bouzy Rouge") & our cat, "Violet". (A natural--organically certified--alternative to the usual petting zoo--) We'll put a glass of wine in your hand and your children.... can skip stones in the pond, explore the cave, make colorful chalk pictures on the crush pad, learn the basics of organic farming, pursue a "scavenger hunt" and in general, thoroughly enjoy themselves. Interested in hiking through our Rutherford appellation area's vineyards? We can arrange it! We take pride in sharing age appropriate education about grapes, grape products and the enjoyment of wine in moderation with our guests. During the three, glorious "outside" seasons in the Napa Valley our tasting room is literally at "The Source" of our production with private tables located next to the Cabernet and Zinfandel vineyard, either under a century-old grove of olives or next to our winery and barrel cellar. We delight in creating a personalized, "off-the-beaten-track" winery immersion experience for our guests. Music in Tasting Room: Robins, Red-tailed hawks, coyotes, Sheep, Guinea Hens, etc. OK!, we'll turn on the jazz or salsa if you'd like, as well! Wine Education: As the 3rd certified organic property in the valley (1990), we enjoy sharing any and every aspect of sustainable, organic and biodynamic practices with you. Questions about hand-crafted wines? It's our specialty. Food Available: We regularly serve guests tastes of our own ranch products: organic olive oil, Zinfandel grilling sauce, Pomegranates---whatever's in season. To join the wine club, visit www.tressabores.com or call 707-967-8027. Join SABOR ("Taste"), the Wine Club of Tres Sabores and receive four shipments each year comprised of new releases, cellar selections and club only wines. Members may choose to receive shipments of three, six, or twelve bottles at a time. A "Red Only" club selection is also available. Members receive wine discounts, invitations to special SABOR gatherings, discounts on purchases and special Tres Sabores events around the country. Members also receive priority on orders for estate olive oil, pomegranate-infused balsamic vinegar and other ranch products. Winter shipments include a custom gift. Please contact us for more information. Two for one Tour and Tastings for a maximum of 2 Complimentary tastings. Tres Sabores is certified under the Napa Green Winery Program by the Napa County Department of Environmental Management (DEM) and the Association of Bay Area Government’s (ABAG) Green Business Program and completed all the regulatory components needed for environmental sustainability. These components included developing water and energy conservation methods, preventing pollution, and reducing solid waste. In addition to developing sustainable winery practices, this program is set to become the standard for the state of California. Tres Sabores is certified under the Napa Green Certified Land Program. Tres Sabores has created and implemented a customized farm plan with measured results that addressed all aspects of its property, vineyard land as well as non-farmed land, including practicing soil conservation, water conservation, stable drainage, riparian corridor enhancement, fisheries and wildlife habitat enhancement and long-term improvement and sustainability.